Did you buy or get a Fitbit wearable for the New Year? You likely tracked the steps you took everyday and tried to add a few more everyday by just moving extra. If you are like some of my colleagues you proudly showed your sleep patterns to everyone, remarking how little sleep you get. Your dismal sleep pattern as a Fitbit device owner is likely not as bad as that of Fitbit shareholders as they see their investment drop 70% from its highs and 30% from its IPO price. Analysts call Fitbit a single product company and liken it to GoPro. It may not look it from all those wearing the bands but let us take a few extra steps to see the reality. 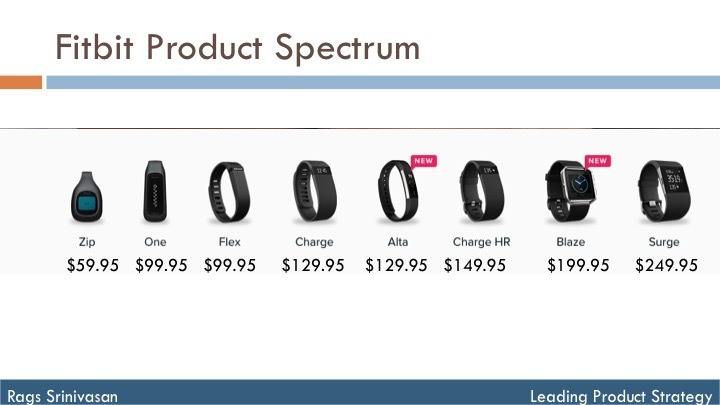 Here is a full spectrum of wearable fitness devices from Fitbit (I left out their scale because that does not have any footprint). Looking at the spread of devices from $60 to $250 price points you may ask how can this be a single product company. The devices are not separate products, they are simply versions of the same product designed for price discrimination. They all target the same customer segment and for the same customer job to be done, just appeal to different willingness to pay among customers. To make this clearer let us map the products on a 2X2. If you boil it down, it comes to two dimensions, one on sophistication of metrics collected and the other the sophistication of display. Looking at this mapping you can see how Fitbit devices are clustered along the main diagonal. 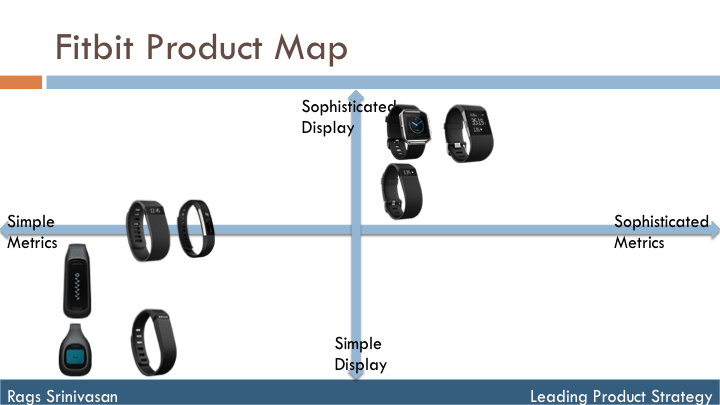 It may appear that the two vacant quadrants are rightfully vacant because customers don’t need sophisticated displays without equal sophistication in metrics and vice versa. Unfortunately that is where disruption happens, when you unbundle a particular feature and enable customers get that through other means. In the lower right quadrant there is disruption coming from the likes of Mi Pulse that sells for just $16. Such low priced devices increase market size measured in number of units but cause drastic reduction in market size measured in dollars. Mi Pulse has no display, it relies on the display customers already have, their phone. But it tracks all sophisticated metrics a $149 or even $200 Fitbit collects. When Mi Pulse makes global entry it can take a huge bite of the entire lower half of the matrix. 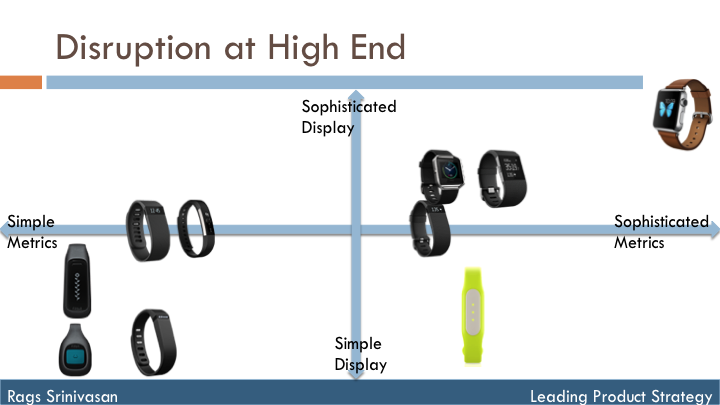 In the upper right quadrant, Fitbit does not have strong foothold even with three versions. 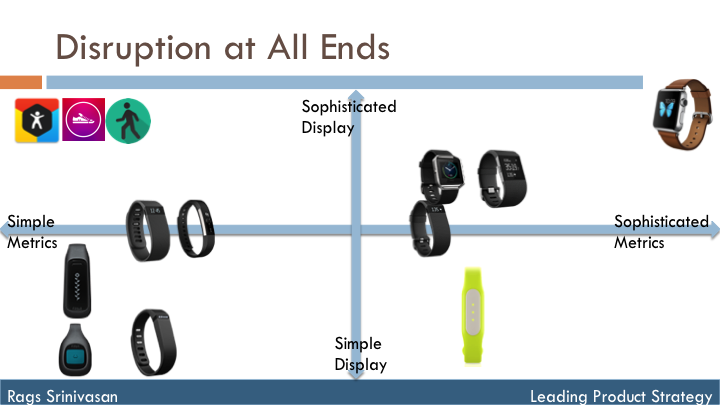 That quadrant is dominated by Apple Watch that sold more than 3 million devices last quarter. With its Watch OS, App Ecosystem and tighter integration to iOS ecosystem Apple will end up owning this quadrant, eroding any share Fitbit has here. Finally the top left quadrant. This is occupied by phone based Apps that measure steps and manually measure other metrics. These Apps are either free or cost less than $2 compared to cheapest pedometer from from Fitbit. These Apps can creep into bottom left quadrant, occupying gaps left by Mi Pulse like cheaper devices. That leaves no space to grow for Fitbit. Recently Fitbit CFO said they have 90% share in the wearable market. That should be a big reason for concern, on growth. As they get crowded out of the market landscape, as low end disruptors cause TAM (Target Addressable Market) compression with $16 devices and $2 apps, and high end disruptors create and capture all value at $300+ market, Fitbit will find not many steps it can take. ← What is your Product Vision?